Annexin I, one of the 20 members of the annexin family of calcium and phospholipid-binding proteins, has been implicated in diverse biological processes including signal transduction, mediation of apoptosis and immunosuppression. Previous studies have shown increased annexin I expression in pancreatic and breast cancers, while it is absent in prostate and esophageal cancers. Data presented here show that annexin I mRNA and protein are undetectable in 10 out of 12 B-cell lymphoma cell lines examined. Southern blot analysis indicates that the annexin I gene is intact in B-cell lymphoma cell lines. Aberrant methylation was examined as a cause for lack of annexin I expression by treating cells 5-Aza-2-deoxycytidine. Reexpression of annexin I was observed after prolonged treatment with the demethylating agent indicating methylation may be one of the mechanisms of annexin I silencing. Treatment of Raji and OMA-BL-1 cells with lipopolysaccharide, an inflammation inducer, and with hydrogen peroxide, a promoter of oxidative stress, also failed to induce annexin I expression. 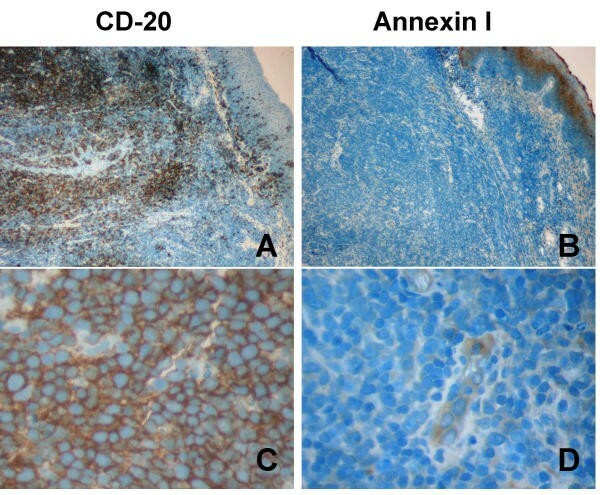 Annexin I expression was examined in primary lymphoma tissues by immunohistochemistry and presence of annexin I in a subset of normal B-cells and absence of annexin I expression in the lymphoma tissues were observed. These results show that annexin I is expressed in normal B-cells, and its expression is lost in all primary B-cell lymphomas and 10 of 12 B-cell lymphoma cell lines. Our results suggest that, similar to prostate and esophageal cancers, annexin I may be an endogenous suppressor of cancer development, and loss of annexin I may contribute to B-cell lymphoma development. The Annexins comprise a family of 20 calcium- and phospholipid-binding proteins. Expressed in organisms ranging from molds and plants to mammals, this family of proteins has proven evolutionarily conserved as well as functionally diverse. Structurally, annexins consist of a 70 amino acid core domain and an N-terminal domain, which is variable in both length and sequence, and imparts upon the family its functional diversity. Annexin I has been implicated to have a biological role in inhibition of phospholipase A2 , as a substrate for epidermal growth factor receptor  and intracellular calcium release , regulation of hepatocyte growth factor receptor signaling , and membrane trafficking . Substantial evidence suggests a role for annexin I in glucocorticoid-induced immunosuppression [6, 7] and MAPK/ERK pathway [7, 8]. Increased expression of intracellular annexin I is seen in bronchial epithelial cells grown in the presence of dexamethasone  and secreted annexin I appears to be proteolytically degraded by the human neutrophil elastase to an inactive form [10, 11]. Annexin I is a critical mediator of apoptosis [12–15]. While overexpression of annexin I has been observed in pancreatic , breast and gastric cancers , reduced or no expression of annexin I has been reported in prostate and esophageal cancers [18–21]. Thus differential regulation of annexin I in a tissue specific manner may be associated with the development of cancers in these sites. Absence of annexin II expression has been reported in two B-cell lymphoma cell lines, Raji and OMA BL-1 . While annexin II is closely related to annexin I in amino acid identity, its cellular function is clearly different . Both annexins I and II are upregulated in pancreatic carcinoma , and recent reports have shown absence of both annexins I and II in prostate carcinoma [20, 21, 23, 24]. Thus, it appears that both annexins I and II may be coordinately regulated. In view of these observations, the expression of annexin I in human B-cell lymphomas and cell lines was investigated in this study. The human B-cell lymphoma cell lines used in this study are: progenitor B-cell lines (Nalm-6, REH, HPB-Null, PBE-1), B-lymphoblast cell lines (WI-L2, TK-6, DW-10, DHL-16), Burkitt's lymphoma cell lines (Raji, Ramos, OMA-BL-1, Namalwa). TK-6 is a lymphoblast cell line that is heterozygote for thymidine kinase. TK-6 is a derivative of the WI-L2, a lymphoblast cell line. DW-10 and WI-L2 are EBV transformed mature B-cell lines. PBE-1 and NALM-6 are both precursor B cell acute lymphoblastic leukemia cell lines. NALM-6 is an established cell line and PBE1 is a line established short term from a patient with ALL at the University of Nebraska Medical Center [Please note that a DNA fingerprint analysis  of over 500 lymphoma-leukemia cell lines indicated that PBE-1 and NALM6 may be identical]. DHL-16 is a follicular B-cell lymphoma cell line . Human adenoids were used as a source of normal B-cells, and contained >80% B-cells as determined by cell sorting and flow cytometric analysis. In other experiments, normal B-cells were isolated from PBL of a healthy volunteer using the human B-cell isolation kit (Miltenyi Biotec Inc., Auburn, CA) as per manufacturer's guidelines. SW1116, HeLa and 293T cells were used as positive controls in the indicated experiments. Cells were grown in a growth medium consisting of Eagle's minimum essential medium (GIBCO-BRL, Grand Island, N.Y.) supplemented with 10% heat-inactivated fetal bovine serum, L-glutamine (2 mM), penicillin (100 U/ml) and streptomycin (100 μg/ml). All cell lines were determined to be mycoplasma-free by a PCR-based mycoplasma detection assay. 5-aza-2'-deoxycytidine (deoxyC, Sigma Chemical Co., St. Louis, MO) was freshly prepared in distilled water. Raji and OMA BL-1 cells, growing in T25 flasks, were incubated in one of the following: 3 μM or 6 μM deoxyC for 3 days or 6 days; 2.5 to 10 μg/mL lipopolysaccharide from E. coli (Sigma) for 24 hours; or 100 μM H2O2 for 2 to 24 hours. Genomic DNA, total cellular RNA and protein were extracted from cells using previously published procedures [22, 27]. Formalin-fixed, paraffin-embedded tissues representing normal tonsil (n = 2), diffuse large cell non-cleaved B-cell lymphoma (n = 2), small lymphocytic B-cell lymphoma (n = 2) and follicular mixed B-cell lymphoma (n = 2) were generously made available for these studies by Dr. Dennis Weisenburger, Department of Pathology and Microbiology, University of Nebraska Medical Center, Omaha, NE. Sequential serial sections prepared from these specimens were used in immunohistochemical analysis. Polyclonal rabbit anti-human annexin I antisera (α646) was a gift from Dr. Blake Pepinsky (Biogen, Boston, MA.). Polyclonal anti-human phosphoglycerate kinase (PGK) antiserum (α35) was prepared as described previously . The mouse monoclonal anti-CD 20 antibody was from Beckman/Coulter Inc. (Westbrook, MA). Protein extracts were prepared from cells using protein lysis buffer containing; 50 mM Tris-HCl pH 7.5, 2.0 mM PMSF, 5.0 mM iodoacetamide, 5.0 mM EDTA, 150 mM NaCl, 0.5% NP-40, and 0.5% Mega-9. Protease inhibitors were added just prior to use (leupeptin at 1 μg/ml and pepstatin at 2 μg/ml). Total amounts of protein extracts was quantitated using Bio-Rad protein assay (Pierce, Rockford, IL). A total of 50 μg of protein from each extract was separated on a 12% SDS-PAGE. After electrophoresis, proteins were transferred to PVDF membrane (Millipore, Bedford, MA). The membranes were blocked in 1X TTBS with 7% powdered milk overnight at 4°C and then probed for 1 hour with rabbit polyclonal anti-human annexin I (α646) at 1:500 dilution and rabbit polyclonal anti-human PGK (α35) at 1:1000 dilution. Anti-rabbit HRP (Promega, Madison, WI) at a dilution of 1:5000 was used for 1 hour at room temperature to detect antigen-antibody complexes. Membranes were developed using ECL+ (Amersham Pharmecia Biotech, Arlington Heights, IL). For quantitation of the immunoreactive band, the blot was scanned on a laser densitometer (Molecular Dynamics, Sunnyvale, CA). For verification of the integrity of the RNA samples and as a control in all the RT-PCR analyses, we examined the expression of the α-tubulin gene. The primers A-tu1 (5'-AAG AAA TCC AAG CTG GAG TTC-3') and A-tu2 (5'-GTT GGT CTG GAA TTC TGT CAG-3'), specific for the α-tubulin gene, generated a 300 bp PCR product corresponding to the α-tubulin gene. Genomic DNA was isolated from Raji, HPB-null, Nalm-6 and HeLa cell lines, and subjected to restriction endonuclease digestion. Southern blot analysis  of genomic DNA was performed using radiolabeled 522 bp annexin I cDNA product from the PCR reaction as described above. Standard methods were used to prepare sequential 8 μM sections of paraffin-embedded tissues, which were mounted on polylysine-coated glass slides. Tissues were cleared and rehydrated with two 10-minute rinses in a ready-to-use tissue deparaffinization solution (Biogenex Inc. San Ramon, CA). Sections were then stained by the immunoperoxidase method using the ready-to-use Vectastain Quick kit (Vector Labs, Burlingame, CA). Primary antibodies used included rabbit polyclonal anti-human annexin I antibody and mouse monoclonal anti-human CD 20 antibody. Annexin I protein levels were measured by immunoblot analysis in various B-cell lymphoma cells along with and other cell lines known to express annexin I. A typical autoradiogram is shown in Figure 1a. Extracts made from adenoid cells (containing > 80% B-cells) were used as control normal cells, and HeLa cell extracts were used as positive controls. As expected HeLa cells (lane 1) expressed high levels of annexin I, and adenoids (lane 13) expressed annexin I, but at a much reduced level when compared to HeLa cells. Annexin I protein was undetectable in any of the progenitor B-cell lines (Nalm-6, REH, HPB-Null, PBE-1) and Burkitt's lymphoma cell lines (Raji, Ramos, OMA-BL-1, Namalwa). Among the B-lymphoblast cell lines (WI-L2, TK-6, DW-10), only WI-L2 expressed annexin I, while its derivative TK-6 did not express annexin I. Using a different source of normal B-cells (obtained from PBL of a healthy volunteer), we once again confirmed annexin I expression in normal B-cells (lane 1, Figure 1b). In addition, we find significantly reduced expression of annexin I in the Burkitt's lymphoma cell line Raji and the follicular lymphoma cell line DHL-16, when compared to the normal B-cells as evidenced by the levels of PGK in the same blot. The expression of 3-phosphoglycerate kinase (PGK, Figure 1) included as an internal control on the blots was seen in all the cell lines except the adenoids. Expression of proliferating cell nuclear antigen and the 70 and 90 kDa subunits of Ku autoantigen were unaffected in these cell lines (data not shown), indicating a specific lack of expression of annexin I. Expression of annexin I in human B-cell lymphoma cell lines. Whole cell extracts were prepared from HeLa (lane 1), REH (lane 2), HPB-Null (lane 3), DW-10 (lane 4), Nalm-6 (lane 5), Namalwa (lane 6), PBE-1 (lane 7), Ramos (lane 8), Raji (lane 9), OMA-BL-1 (lane 10), WI-L2 (lane 11), TK-6 (lane 12) and adenoid (lane 13) in panel A and extracts prepared from normal B-cells obtained from PBL (lane 1), DHL-16 (lane 2) and Raji (lane 3) cells in panel B were used to measure expression of annexin I. Extracts equivalent to 20 μg of protein were subjected to SDS-gel electrophoresis and immunoblotting as described in Materials and Methods. 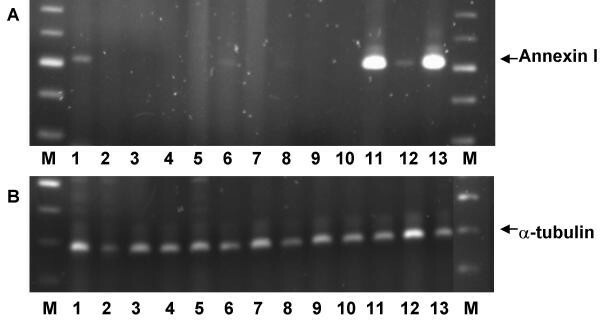 Protein blots were incubated with a 1:2000 dilution of polyclonal anti-annexin I (α646) antiserum and 1:500 dilution of anti-human PGK antiserum (α35). Positions of the molecular weight markers, PGK and annexin I are indicated. In view of the lack of annexin I protein expression in the B-cell lymphoma cell lines (Figure 1), annexin I message expression was examined by RT-PCR analysis (Figure 2). RT-PCR analysis showed that annexin I message was present in adenoids (lane 1) and absent in all of the B-cell lymphoma cell lines. As expected, HeLa (lane 11), 293T (lane 12) and SW1116 (lane 13) cells showed annexin I message. RT-PCR analysis of annexin I expression in B-cell lymphoma cell lines. Panel A shows mRNA expression of annexin I in B-cell lymphoma cell lines, adenoids, and positive control cell lines (HeLa, 293T and SW1116). Panel B shows a corresponding RT-PCR analysis of α-tubulin in the same cell lines. The cell lines shows in both panels are: adenoid (lane 1), OMA-BL-1 (lane 2), Raji (lane 3), Ramos (lane 4), PBE-1 (lane 5), Namalwa (lane 6), Nalm-6 (lane 7), DW-10 (lane 8), HPB-null (lane 9), REH (lane 10), HeLa (lane 11), 293T (lane 12) and SW1116 (lane 13). The 100-bp ladder is shown in lane M.
Annexin I gene was examined in selected cell lines by Southern blot analysis (Figure 3). There was no alteration in the annexin II genomic DNA as seen by no change in the hybridization pattern after cleavage by restriction enzymes, Xba I, Bam H1 and Apa I. These enzymes generated specific fragments which were identical in the Raji, HPB-null and Nalm-6 cell lines when compared to HeLa cells. Therefore, the down-regulation of annexin I expression in B-cell lymphoma cells is at the transcriptional level. Southern blot analysis. Genomic DNA from Raji, HPB-null, Nalm-6 and HeLa cell lines was digested with XbaI (X), BamH1 (B) and ApaI (A), or left undigested (U) as indicated and Southern blot analysis was performed as described under Materials and Methods. Methylation of the CpG dinucleotide has been shown to directly inhibit transcription or stabilize structural changes in chromatin that prevent transcription. The nucleotide analogue, deoxyC was used to inhibit DNA methylation in Raji cells to measure reexpression of annexin I protein. Exposure of Raji cells to either low (1 μM) or high (10 μM) deoxyC did not result in reexpression of annexin I protein after 3 days (lanes 3 and 4). However, after 6 days of treatment with deoxyC, as a weak protein band (lanes 5 and 6) that appeared at the position of annexin I was observed. There was no difference in annexin I reexpression at 1 μM or 10 μM deoxyC concentrations. To determine if inflammatory stimulus provided by exposure of cells to bacterial LPS will result in expression of annexin I, Raji cells were treated with various concentrations of LPS, and annexin I protein expression was measured by immunoblot analysis. 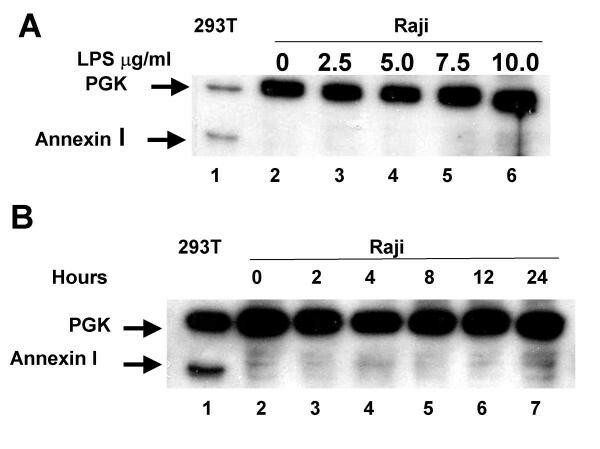 The data in Figure 5 (panel A) show that exposure of Raji cells to LPS does not result in expression of annexin I in these cells. The effect of producing reactive oxygen species (ROS) in Raji cells on annexin I expression was also investigated. 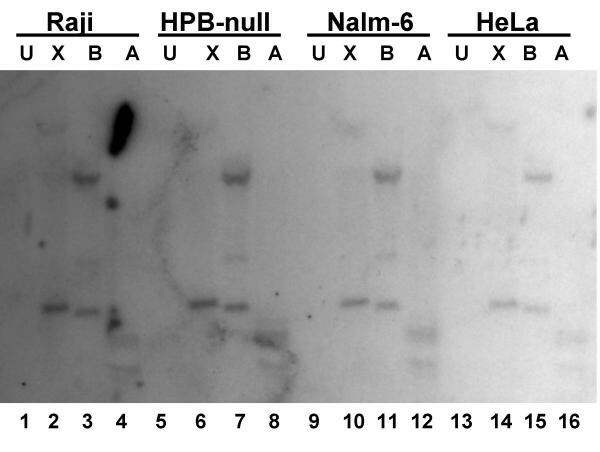 The data in Figure 5 (panel B) show that exposure of Raji cells to H2O2 did not cause annexin I expression. Methylase inhibitor 5-aza-2'-deoxycytidine does not cause reexpression of annexin I in Raji cells. Raji cells were cultured in the absence (lane 2) or presence of 1 μM (lanes 3 and 5) and 10 μM (lanes 4 and 6) of 5-aza-2'-deoxycytidine for 3 (lanes 3 and 4) or 6 days (lanes 5 and 6). 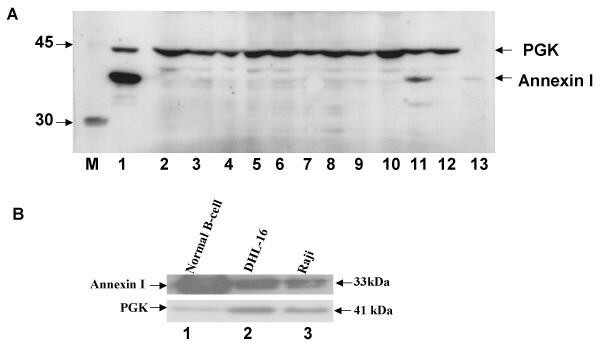 Protein extracts made from cells were subjected to Western blot analysis for annexin I and PGK as in Figure 1. Annexin I expression was studied by immunohistochemical analysis on archival specimens representing various B-cell lymphomas. Tonsil tissue sections were included as representatives of normal tissue. Positive identification of B-cells was performed by immunodetection of CD 20 antigen. As expected, CD 20 positivity was observed in the germinal centers (Figure 6, panel A) and a few CD 20 positive cells were observed in the epithelial layer. Annexin I expression was predominantly in the epithelial layer (Figure 6, panel B). Weakly positive annexin I expressing cells were found within the germinal center. At higher magnifications (Figure 6, panels C and D), distinct cytoplasmic localization of annexin I was observed in a subset of cells within the germinal center (Figure 6, panel D). These results are consistent with the immunoblot data (Figure 1) indicating a low-level of annexin I expression in the adenoids. Treatment of Raji cells with LPS or H 2 O 2 does not induce annexin I. Raji cells were treated with 0 to 10 μg/ml of LPS for 24 hours (Panel A) or with 100 μM H2O2 for 0 to 24 hours (Panel B). Extracts made from cells were subjected to SDS-PAGE and immunoblot analysis for annexin I and PGK as described under legend to Figure 1. 293T cells were included as positive control. Annexin I expression was absent in the B-cell lymphomas (Figure 7). Distinct B-cell clusters were observed by their CD 20 positivity in diffuse large cell non-cleaved B-cell lymphoma (Figure 7, panel A), small lymphocytic B-cell lymphoma (Figure 7, panel C) and follicular mixed B-cell lymphoma (Figure 7, panel E). However annexin I expression was undetectable in each of these B-cell lymphomas (Figure 7, panels B, D and F) even at higher magnifications (data not shown). Strong epithelial cell staining of annexin I was observed in these specimens (Figure 7, panel D). These results are consistent with the absence of annexin I expression in B-cell lymphoma cell lines (Figures 1 and 2). Immunohistochemical analysis of annexin I in normal tonsil. Panel A: CD 20 staining of normal tonsil reveals clusters of B-cells referred to as germinal centers. Panel B: Annexin I staining of the next serial section shows annexin I presence in tonsil epithelium with weak immunopositivity in the germinal centers. At higher magnifications (panels C and D), distinct cytoplasmic staining of annexin I is observed in a subset of cells (panel D) that represent the germinal center CD 20 positive cells (panel C). Magnification: 40× (panels A and B), 400× (panels C and D). Annexin I expression is undetectable in B-cell lymphomas. Panels A and B: CD 20 staining illustrates four localized clusters of B-cells (panel A). No Annexin I staining appears in the next serial section (panel B). Panels C and D: CD 20 positive B-cells appear in a defined cluster in this section (panel C). Staining for Annexin I clearly indicates absence of the protein in this B-cell cluster (panel D). However, Annexin I staining does localize in the epithelial layer of the section. Panels E and F: CD 20 positive B-cells form large follicles that are characteristic of this type of lymphoma (panel E). Annexin I staining does not localize in these follicles (panel F). Magnification: 40×. In this study, the expression of annexin I in B-cell lymphoma was examined. Annexin I is a pleotrophic, calcium and phospholipid binding protein whose proposed functions include anti-inflammatory activity, mediation of apoptosis, regulation of cell differentiation, and membrane trafficking [8, 15, 30]. Annexin I is expressed in the secretory bronchial epithelial cells  and its anti-inflammatory N-terminus is lost in the bronchoalveolar lavage fluids from healthy smokers  indicating the importance of this protein in human health and disease. Annexin I is frequently overexpressed in human cancers including pancreatic  and breast  cancers. However, recent reports indicate that annexin I expression is down-regulated in other human tumors, particularly esophageal and prostate tumors [19–21]. Annexin I is similar to the closely related protein annexin II, even though the two proteins are proposed to carry out distinct physiological functions. Curiously, both annexins I and II are lost in prostate cancers [20, 21, 23, 24]. Altered expression and loss of annexin II in B-cell lymphoma cell lines has been reported previously . In view of this, the expression of annexin I in B-cell lymphomas and cell lines were examined in the present study. The data presented in this manuscript indicate that annexin I is present in normal B-cells (Figure 1, panels A and B). Immunohistochemical examination of normal tonsil sections (Figure 6) indicates that a subset of cells within the germinal centers distinctly express annexin I. The germinal center normally harbors highly proliferative B-cells , however it also represents a highly dynamic environment that creates intense genomic instability among B-cells . It is unclear if the subset of B-cells that show annexin I expression represent proliferative cells or cells that are undergoing differentiation. Association of annexin I expression and cellular differentiation has been shown previously . In contrast, most cells lines and neoplasms of pregerminal B-cells did not show detectable annexin I expression. Our data are consistent with the loss of annexin I observed in prostate and esophageal cancers . The etiology of reduced annexin I expression was studied by examining the possible mechanisms. Southern blot analysis indicated that annexin I gene was intact in the Raji and OMA-BL1 cells, indicating that genomic deletion of annexin I is not the cause for loss of annexin I. Gene silencing by hypermethylation of annexin I promoter was examined by culturing cells in the presence of a demethylating agent, and the data indicated reexpression of annexin I protein after prolonged exposure to 10 μM concentration of deoxyC. Thus, methylation of annexin I promoter could be one of the mechanisms for annexin I silencing in these cells. 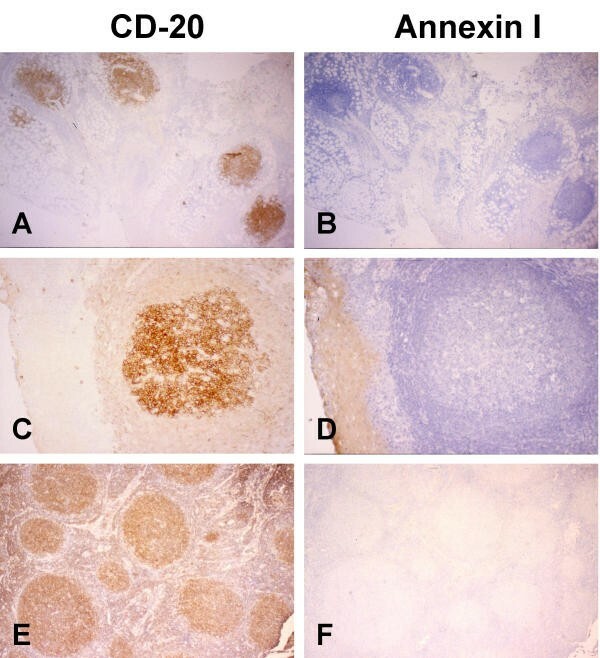 These results are similar to the reexpression of annexin II observed in a prostate cancer cell line after treatment with deoxyC , indicating methylation as a general mechanism for silencing annexins I and II in cancer tissues. Treatment of cells with a pro-inflammatory agent or an apoptosis inducing agent did not result in expression of annexin I. The data presented in this paper show that the anti-inflammatory protein annexin I is expressed in normal B-cells, but not expressed in B-cell lymphomas and cell lines, similar to the absence of annexin I in prostate and esophageal cancers. Thus, annexin I may be an endogenous suppressor of cancer development, and loss of annexin I may contribute to B-cell lymphoma development. The additional mechanism(s) by which annexin I expression is down-regulated and the physiological consequences of annexin I loss in B-cell lymphomas need further investigation. The author wishes to thank Dr. Dennis Weisenburger for providing tissue specimen, Dr. Sam Pirucello for providing the cell lines, and Dr. Abhijit Banerjee for consultation. JKV conceived of the project and directed the experiments, analyzed the data and prepared the manuscript. ES performed the experiments as a summer research intern. VKG isolated normal B-cells and performed immunoblot analyses.